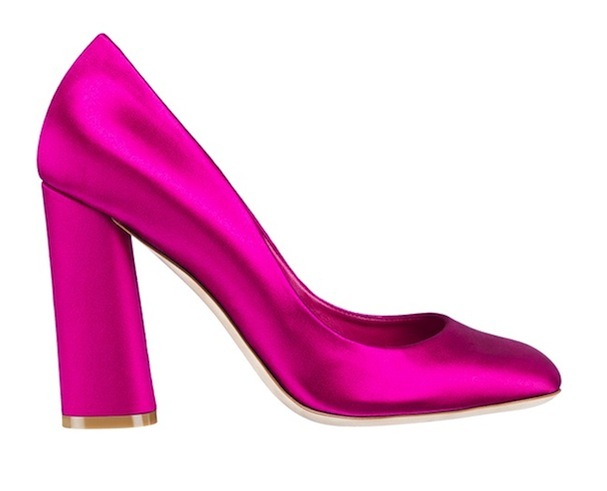 I came across these Christian Dior fuchsia metallic pumps and thought they were absolutely stunning! The vibrant color and sculptural shape are fabulous. I'm smitten even though I probably wouldn't be able to walk in them. I totally have footwear on the brain this week. I think somebody needs to go shoe shopping! I like the cap on the heel of these shoes, but I couldn't walk in them either. I tried to wear a pair of 1.5" or 2" wedges for an interview a few months ago and I made it about 20 feet from my car before I changed back into flats. My ankle wasn't agreeing with my decision. Oh. My. Gosh. These are insane. That color is just incredible! Oh my goodness, did I just die and go to shoe heaven? This shoe is breathtakingly beautiful, but I think I could never wear it: I would be too scared to scratch it, or get it dirty! Another pair to add to my bookshelf, maybe? :) Now that I'm thinking about it, this photo would make for a perfect print for a closet, or a vanity table! Gorgeous! I'm smitten by their color Rowena! Like a gem/jewel stone hahaha I wouldn't be able to walk in them either. gorgeous! I probably couldn't walk far in them either, but they are beautiful. love the color and the shape! and they look so comfy too! They are beautiful! Love the colour. Those shoes are absolutely beautiful and very stylish. It's a lovely color too. Very glamourous. What an amazing colour and I love the simple design too. The block heel may make them easier to walk in. Omg the shine, the color, the shade and the built. It's a shoe heaven! These are stunning, but the heal is fairly thick so you would probably be able to walk in them ok for at least a short while. But these are the poster child for " A pop of color!" OMgosh, these are gorgeous Rowena. Great color for spring. I'm trying to get used to the chunky heel. JCrew is doing pumps with metallic tips .. have never seen them in person or worn them but the price is less than these. I just spent a boatload on a pair or jeans and pumps.. GEEZZZ.. the prices are ridiculous. I always have shoes on my mind haha. Love that colour! Thanks for your visit sweetheart, Happy Friday! Shocking colour! And they actually look comfortable too. I am just so much into high heel!!! The colour is so nice!! !